Your academic advisor will register you for some or all of your first term classes. For each term thereafter, we give you the tools to register on your own. See the Orientation website for the specific course registration process for your advising unit. Look for the Process/Timeline for First Year Students. Students who have not selected a major will be advised by the staff in the Exploratory and Pre-Professional Advising Center. Submit your immunization records to Student Health Services. Your advisor will not be able to register you for classes until you have fulfilled this requirement. Be sure that you have submitted transcripts for course work like Advanced Placement (AP) or college credits. Some students will enter UB with AP credit; this credit can count towards a UB degree or in some cases credit towards major and UB Curriculum (general education) requirements. Official transcripts from the College Board must be sent to UB. Use school code 2925 to distinguish UB (SUNY Center Buffalo) from SUNY College Buffalo (Buffalo State). In some instances new students will not know their AP score when they speak with an advisor for course registration. It is important that you contact your academic advisor when you find out your AP scores as it may affect your first semester course registration. Some students will transfer credits earned at other accredited colleges or universities to UB. It is important that you tell your advisor about any college credit you have earned. Your advisor will need to know the school, course name, and number for all college level credit completed. Go online to see your class schedule in the HUB Student Center via MyUB (UBIT Name & Password required). Your advisor will also mail you a copy of your schedule along with the Your Academic Schedule brochure. If you have any questions about your schedule contact your academic advisor. Contact information for your advisor is typically in with your schedule brochure. If you are not sure who to contact use the Advising Directory to locate your advising center. As a registered student at UB, you are financially and academically responsible for the courses in which you are enrolled. Contact your academic advisor to be sure your courses are dropped. Cancel your enrollment in any other campus services (housing, dining services, etc.). Consult the When You’re Not Enrolling at UB Checklist. What is Finish in 4? Finish in 4 is an initiative to help UB students complete their four year degree in four years! It is UB’s commitment to provide students with the resources and guidance needed to achieve this goal. New freshman are encouraged to take the Pledge to Finish in 4 upon enrolling at the University. Review the Finish in 4 website for more information. How do I sign up for Finish in 4? Look for the “Finish in 4” question on the Orientation Data Form. This is how new freshmen (entering in the fall term only) can opt to take the Pledge. Please be sure to first review all information on the Finish in 4 website and discuss any questions you may have with your advisor. If you do not take the Pledge on the Orientation Data Form and decide later that you wish to do so consult with your advisor. What classes will I take my first year? A typical freshman schedule is made up of courses that fulfill major or UB Curriculum (general education) requirements. To graduate, students need a minimum of 120 credits consisting of requirements from their major, UB Curriculum, and electives. New students typically take approximately 15 credits a semester. Some majors require more than 120 credits. A major is a focused concentration in one area of study. Major requirements vary from 31 to 85 credits or more, depending on the field and degree chosen. Many majors have introductory or prerequisite courses — from two to 10 courses — that must be completed before acceptance into the major. What if I don’t have a major yet? Don’t worry. If you enter UB as an Exploratory student you will be assigned an academic advisor who will suggest courses to help meet the UB Curriculum (general education) requirements and also help you explore majors. Note: If you are transferring to UB with 60 credits or more, it is highly recommended that you be accepted into a major, talk to your advisor right away. What is the UB Curriculum (general education)? The UB Curriculum is a unique program of general education for all undergraduate students at UB. How does my advisor know I’m ready for a particular course? Writing — SAT/ACT/AP scores and/or previous writing course experience. Math — SAT scores, previous math course experience and for calculus courses ALEKS placement. Foreign language — previous language course experience. 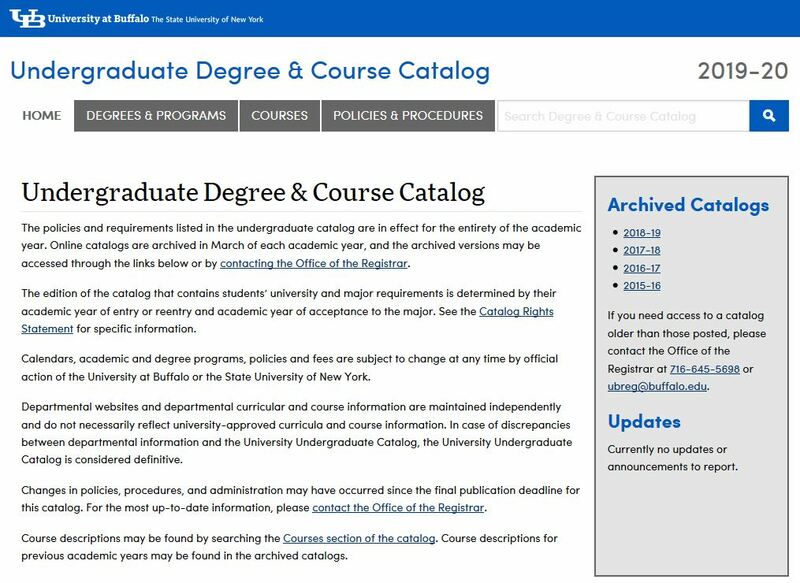 Have the College Board/ETS send your scores to UB — and be sure to tell your UB advisor, because this may affect your course selection. Review How to Request Official Score Reports for Exam Credit or contact the College Board for further information. What if I’ve taken college courses? If you’ve taken or are currently taking college-level courses, tell your advisor and have an official transcript sent to the UB Admissions Office. Review Forward Your Transcripts for further information. Why don’t I have the same schedule as my friend? Class schedules are designed to meet each student’s individual interests, needs, and abilities, and to fulfill different UB Curriculum or major requirements. You may not take the same required courses at the same time as your friends. You must complete the Not Enrolling at UB (PDF) form. If you believe you will be able to enroll at UB for a future semester, please contact the Office of Admissions. They can retain your application for entry at a future time. If you are enrolled for courses and then choose not to attend UB be aware that there is a deadline date for dropping courses without financial penalty in each semester. Refer to the Student Calendars to see the deadline date for the semester you are enrolled.